Months of work to restore a 100-year-old Tube station which is seen as an important part of east London's railway heritage, begins on Monday. 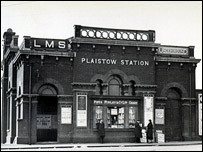 Plaistow station, now a listed building, was built between 1903 and 1905 for the London, Tilbury and Southend Railway. Its walls, ticket hall, platforms, stairs and bridge are to be refurbished from Monday until the end of the year. Most work will be done when the Tube is closed during the night. London Underground (LU) says the station's features will be carefully restored or replaced. Modern poster frames will be replaced with ones "more in-keeping with the age of the station". District Line manager Bob Thorogood said: "Plaistow station is an important part of east London's railway heritage and we are looking forward to seeing it restored to its proper condition."